This week I had the pleasure of whiling away a few hours with Peter Dunne, my first wine boss in Mitchell & Son, and someone whose company I enjoy greatly. We promise to meet every six months but it inevitably happens only every 18-24. Peter provided the wines on this occasion, a 1967 Gevrey-Chambertin from Mommessin and a Ch. 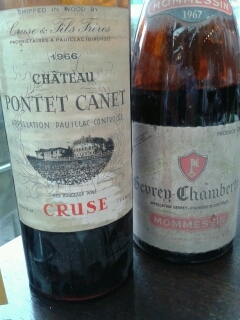 Pontet-Canet 1966. Both were bottled by Mitchell and Son in Dublin as was the practice then. The Burgundy was delightful and instead of fading, improved as the afternoon wore on (or maybe it was us). It had sweet ripe fruit, no sous-bois or putrification as Peter put it; just pleasant soft silky fruit. The Pontet-Canet will not go down as one of the greatest wines I have tasted, but was almost as nice in its own way. Drier and firmer with some old fading mahogany fruit, it was still all together, although modern winedrinkers might complain of a lack of fruit. Drinking elderly wine is a particular pleasure, something not everyone enjoys, but I have to say there are few things better than sniffing and sipping away at light mature wines in good company for a few ‘lost hours’.